Payne Campground is accessed from Kellogg Creek Road (driving directions to Payne Campground). The US Army Corp of Engineers manages the campsite through their Lake Allatoona office and hires a private contractor to run the campground. There are 60 campsites (campground map). Forty nine sites have 50 amp electric and water hookups. 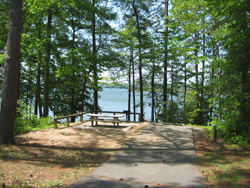 Some campsites are considered premium, which means they are open on one side to the shore of Lake Allatoona. Payne Campground also has hot showers and a coin laundry facility. The restrooms, one of the campsites, and the swimming area are handicapped accessible. Fees - $18 - $56 per night (subject to change). Kids' Stuff - There is a swimming area with a nice sandy beach. You can fish in Lake Allatoona from the shore, provided you abide by Georgia's fishing regulations. RVs - Two sites have sewer hookups. Pads vary from 20 - 57 ' and most of these are back-in sites. There is a a dump station available. The Payne Campground Map provides details about which campsites can be reserved. Operating Season - Payne Campground opens in late March and closes in early September. Early and late in the season the campground is only open on the weekends. You can call the management office (see above) or check their website for exact dates. 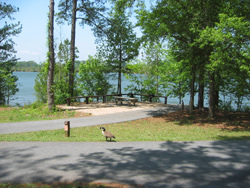 Boat Launch - Campers in Payne Campground are provided free access to the campground's boat launch. To obtain directions from your location click on "to here" on the map below, enter information for your starting location (for example your street, city, state, and zip code) in the box that opens, and then click on the GO button. The directions and a map of the route will open in a new browser window. You can interact with the map below (scroll around, zoom in or out, etc.) or click on the text "View Larger Map" below this map to open up a new window with an interactive map of the local area around Payne Campground.